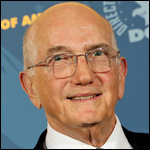 Ed Sherin was indebted to the DGA long before it announced that he would be presented this month with its Honorary Life Member Award. About 20 years ago, the DGA bailed him out with a lump-sum retirement payout after he and his wife, actress Jane Alexander, were swindled out of their life savings. “The fat was in the fire, and they pulled it out,” says Sherin, DGA national VP from 1997-2004. Sherin, a gunnery officer in the Korean War, is being honored for a career that has included work in theater, film (“Valdez Is Coming”) and television (“Law & Order”). He joins a distinguished list of winners that includes the likes of Frank Capra, Walt Disney and Charlie Chaplin. For Dennis W. Mazzocco, who helped telecast 12 Olympic Games, getting the DGA’s Franklin J. Schaffner Achievement Award is almost like winning a gold medal. Mazzocco, abandoning college plans to become a doctor, first made his broadcasting mark at ABC Sports but eventually expanded his resume to include news programs such as “Nightline” and Good Morning America,” variety and reality shows such as the Academy Awards broadcasts and “Dancing With the Stars” and daytime serials. Katy Garretson, awardee of the DGA’s Frank Capra Achievement Award, envisioned a career in law before a college job as a Universal Studios tour guide shifted her interest toward the entertainment industry. Garretson, whose career as an assistant director included a long stint with “Frasier,” considered her work with the guild a second fulltime pursuit.